Canine babies – puppies – just like human babies, need to receive vital nutrition in order to ensure proper development. Mother’s milk contains essential nutrients that puppies need to thrive, such as DHA, which supports brain development, calcium, protein, and a number of other crucial vitamins, minerals, and nutrients. Without these essential nutrients, a puppy’s chances of thriving and growing into a strong, healthy adult dog will be significantly reduces. Despite the importance of a mother’s milk, there are a number of reasons why puppies may not be able to access this food source. A puppy may have been abandoned by his mother or his mother may have been injured or perished during birth or shortly thereafter. Non-reputable breeders may take puppies away from their mothers too soon. Or, a canine mother may not be able to produce enough or any milk for her litter of puppies. In some cases, canine mothers refuse to feed their pups for one reason or another. Whatever the reason, if you have a puppy that doesn’t have access to his mother’s milk, that doesn’t mean that his nutrition and health has to suffer. By providing your puppy with the right care and offering him specially designed products that are made specifically for puppies, you can ensure your little pooch is getting the balanced nutrition that he needs so he can grow up strong and health. A puppy milk replacer is an absolutely essential product for young puppies that don’t have access to their mother’s milk. But what exactly is a puppy milk replacer? What benefits do they offer? In this guide, we’ll answer these questions and more; but first, we’d like to present to you our picks for the best puppy milk replacers that are currently on the market. What is a Puppy Milk Replacer? Now that you’ve had a sneak peek at our top picks for the best milk replacer for puppies, let’s take a closer look at each option. Below, we offer a more in-depth review of each of these products. We highlight the ingredients used in each product, the benefits that they offer, what we like about them, and what pet parents who have used them had to say. Once you have finished reading through the reviews and have decided which option you think will best meet the needs of your pup, click on the buttons to find the best prices currently available on Chewy and Amazon. 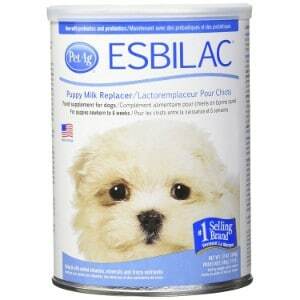 First up on our list of the best puppy milk replacers is Pet Ag Esbilac. This is one of the most reputable puppy milk formulas on the market, and for good reason; it’s made of the highest quality ingredients and offers a nutritional content that very closely resembles the nutrition that natural mother’s milk offers. It’s all natural and completely free of preservatives, so you can rest assure that your pup will be getting the very best nutrition possible. This formula contains essential vitamins and minerals that puppies need to thrive. It’s also contains prebiotics and probiotics, so it will help to support your pet’s immune system and digestive health. This puppy formula is easy to digest so it won’t cause an upset stomach, and it’s supposed to be very palatable, so you shouldn’t have any problem getting your puppy to consume it. The ingredients that are used in this formula include vegetable oil, butter fat, dried skimmed milk, whey protein concentrate, egg yolk, calcium carbonate, potassium, vitamin E, vitamin B12, thiamine, vitamin D3, potassium, and so many other essential nutrients that developing dogs need. Made for newborns and puppies that are up to 6 weeks of age, you can start offering this formula to your pet as soon as he is born. You can also use it as a supplement in combination with dry dog food or wet dog food for puppies (as long as your pooch’s teeth have developed enough to tackle dog food.) According to the reviews that we read, this formula is highly recommended by pet parents. It’s also recommended by vets. However, it should be noted that since it does contain whey, it might not be tolerated by all puppies. Final Verdict: If you are looking for a high quality puppy milk replacer, Pet AG Esbilac is a great option to consider. Made specifically for puppies that have just been born up to 6 weeks old, and packed with essential nutrients that mother’s milk contains, this formula will help to support proper development. Next up on our list of the best puppy milk replacers is another option from Pet Ag, but this option is their Goat’s Milk Esbilac Powder for Puppies. Just like the previously mentioned Pet Ag puppy milk replacer, this option is made with all natural ingredients and contains absolutely no artificial preservatives. It’s also made in the USA, so you can have confidence knowing that it meets strict quality assurance rules that the country has imposed. GME is a complete food source for newborn puppies up to six weeks of age. It’s made with real goat milk, so it very closely resembles the nutritional profile of a canine’s milk. It’s also formulated with essential nutrients that young pups’ need to thrive, such as protein, fat, and carbohydrates. Since it’s easy to digest, it shouldn’t cause an upset stomach. If using it as a supplement, you can offer it with a premium quality dog food for sensitive stomachs (as long as your vet has approved feeding your puppy chow). The ingredients featured in this puppy milk replacer formula include dried whole goat milk, soybean oil, calcium, vitamin A, vitamin D3, manganese, folic acid, riboflavin, vitamin B12, thiamine, biotin, and a bevy of other essential nutrients that puppies need to thrive. According to the reviews that we read on Amazon, most pet parents seem very happy with the quality of this formula and the nutritional content that it offers. 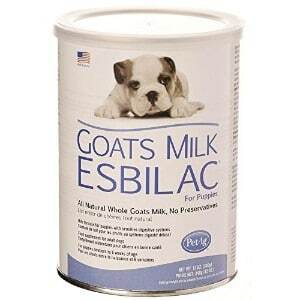 Final Verdict: Pet AG Goat’s Milk Esbilac Powder for Puppies is a premium quality puppy milk replacer. Made with the best ingredients to support health and development, you can have confidence knowing that your pet will receive the nutrition that he needs in order to thrive. SavACaf Grade A Ultra 24 Multi-Species Milk Replacer is formulated for all types of baby animals, including goat kids, lambs, piglets, calves, fawns, and of course, puppies. Since it can be used with so many different species of animals, it’s a great option for farm owners that have dogs and other types of animals to tend to; but of course, you can also use it solely to feed your puppy. Ultra 24 Multi Species Milk Replacer is specially formulated to offer complete balanced nutrition for 10 different species of animals. It’s made with all natural ingredients and features the essential vitamins, minerals, and nutrients that baby animals need in order to support their development. This formula is easy to digest, so it shouldn’t cause an upset stomach, and according to the reviews that we read, puppies find the taste very palatable. Made in the USA, you will have peace of mind knowing that you are offering your young pooch a puppy milk replacer that has passed extensive quality assurance standards. 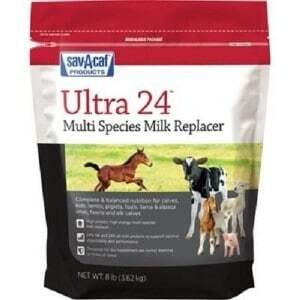 Final Verdict: Whether you are looking for a puppy milk replacer for your young pup, or you have multiple species of baby animals that need to receive a supplemental formula, Savacaf Grade A Ultra 24 Multi Species Milk Replacer is a fantastic option to choose. Made of the highest quality, all natural ingredients and infused with the essential vitamins, minerals, and nutrients that puppies need to thrive, you can be sure that your pet will receive the balanced nutrition that he requires when you offer him this formula. 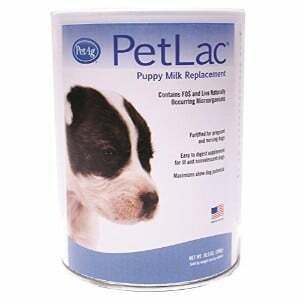 Next we feature PetLac Milk Powder for Puppies. This formula is a high quality food source for puppies that need supplemental milk or that do not have access to their mother’s milk. It can also be fed to older dogs that have sensitive stomachs and need vital nutrients that are easy to digest. This powder milk replacer is infused with natural microorganisms, including prebiotics and probiotics, to help support your baby furry pal’s digestive health and the health of his immune system. It is also formulated with essential vitamins and minerals that puppies need in order to ensure that they are developing properly. According to the reviews that we read, pet parents who have used this product say that it is very easy to use and that their puppies seem to find the taste palatable. Since it’s easy to digest, it can be a great alternative food source for dogs that have sensitive stomachs or digestive health issues. It can also be offered to pets that have dental health problems; for example, you can mix it in with a wet formula of senior dog food to ensure that your older dog is getting the nutrition that he needs. The ingredients featured in this formula include dried whey product, veggie oil, dried whey protein, l-arginine, dried skimmed milk, taurine, phosphate, and more. Final Verdict: When you choose PetLac Milk Powder for Puppies, you can have confidence knowing that your developing pup will be receiving the balanced nutrition that he needs to thrive. Last, but definitely not least, on our list of the best milk replacers for puppies is Nutri-Vet Milk Replacement for Puppies. This formula is made specifically for newborn puppies, and it is also made to be highly palatable to them. It’s made with high quality ingredients and contains a bevy of vitamins, minerals, and nutrients. For example, protein will help to strengthen your puppy’s muscles and joints, calcium will strengthen his bones and teeth, and the infusion of other important nutrients will help to foster proper immune and digestive health. The ingredients featured in this formula include animal and vegetable fat, dried whey protein, dried whey, dried eggs, and a combination of vitamin supplements. While this puppy milk replacer is highly nutritious, it should be noted that it does contain whey, which could potentially upset your pup’s stomach; however, based on the majority of reviews that we have read, most pet parents – and their puppies – are very happy with the product. Final Verdict: If you’re looking for a high quality puppy milk replacer, Nutri-Vet Milk Replacement for Puppies is an excellent option to consider. It’s made with premium quality ingredients, is formulated for newborn puppies, and most customers say that they are very pleased with the product. When it comes to caring for your pet, you want to make sure that you are providing him with the very best of everything. One of the best ways that you can ensure your dog is healthy and happy is by feeding him one of the high quality dog food brands that are on the market. Furthermore, you should also ensure that you are feeding him a recipe that is specially formulated to meet his needs. For instance, if you have a small breed, such as a Shih Tzu, a Pomeranian, or a Pug, you should be feeding him a food for small dogs; likewise, if you have a large dog, such as a Great Dane, a German Shepherd, a Sheepdog, or a Rhodesian Ridgeback, you should be feeding him a specially formulated food for large dogs. But what happens when you have a puppy? Sure, there are a lot of different puppy food formulas on the market; however, if your pup is younger than 6 weeks of age, he still needs the vital nutrients that his mother’s milk supplies to ensure that he is developing properly. Plus, before the age of 6 weeks, canines aren’t supposed to be consuming anything other than their mother’s milk. Fortunately, you can ensure that you are meeting the nutritional needs of your littlest pet friend by offering him the best puppy milk replacer. Puppy milk replacers are exactly what they sound like; a manufactured formula that is made to resemble a canine’s milk. It can be likened to formula that is often fed to human infants. 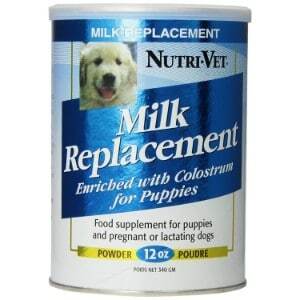 Milk replacer is specially formulated to contain the essential nutrients that growing puppies need in order to thrive. As you can imagine, puppies, like all young animals, require a precise blend of vitamins, minerals, and nutrients in order to ensure that they are developing strong bones, healthy teeth, healthy eyesight, and proper cognitive development, too. Feeding your young pooch a puppy milk replacer will ensure that he is getting the balanced nutrition that he needs so that he can grow into a healthy, strong adult canine.